By 1999 all the buildings at the head of Paddington Basin, from Harbet Road (Irongate Wharf Road) to the St. Mary's Hospital car park in Praed Street, had been totally demolished. The site was protected by hoardings decorated with pictures advertising the new flats which Regalian, the development company, planned to erect in the next few years. The site guard, sitting there in a port-a-cabin, the sole commander of absolutely nothing, gave me permission to go in. 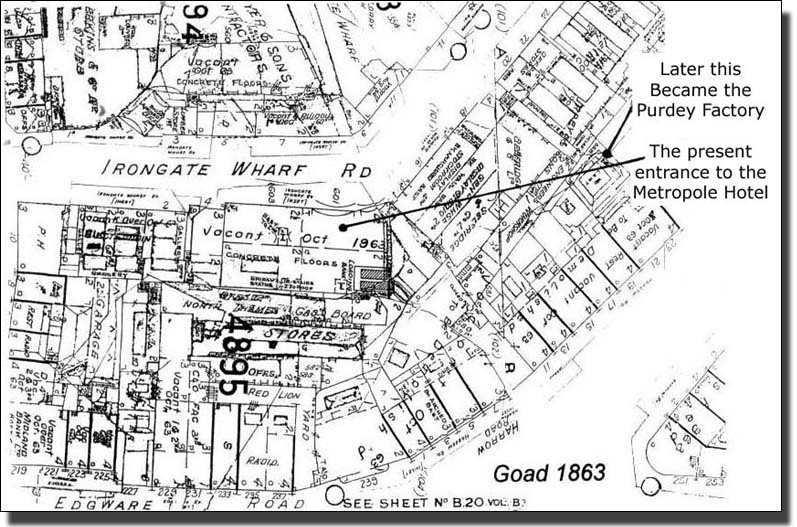 For an hour I was free to wander on the site with the Goad Insurance map of 1891 (below) in my hand. I was reminded of a time when the archaeologist Flinders Petrie, came to a site which had been leveled and destroyed by robbers. Anything saleable had been stolen and the rest smashed to pieces. He collected the pottery fragments, as valuable to him for dating purposes as complete pots, and swept the site. There he found the original foundation lines, set out by the builders millennia before. Using these and with his knowledge of mud brick buildings elsewhere and the dimensions of foundations required for walls of different heights, Petrie was able to calculate these wall heights and draw the lost buildings. The Basin site was equally bare, mostly leveled and with a few dangerous pits boarded over for safety. The roof of 'the old loading shed had been carefully dismantled and stored, ready for re-erection at the far end of the Basin as part of a new Facilities Building. All other buildings had suffered a rougher fate - bulldozed to rubble and carried away. I could make out the walls of buildings and the cobbles of the roadway from Praed Street to the Basin, shown beside Phillips Mills and Co. on the Goad map. Floor levels varied in height, with connecting slopes running up and down. Some parts were in smooth concrete, painted red or pale grey. One could imagine how these floors had been swept daily, scored by the wheels of trolleys, repainted and cared for by generations of people, perhaps even a line of fathers and sons. Now the whole area would become the anonymous foundations for new buildings and the Basin be converted from a stretch of stagnant water into a boating marina and restaurant complex. From the empty site I could see the Metropole Hotel which was being extended for the second time, with the old Purdey gun workshops under scaffolding. These maps allowed insurance firms to calculate the premiums for any particular property. If you stored inflammable material, or were next to a firm that did, your premiums went up as your fire risk was greater. The maps were collected in Atlases and rented out to insurance firms, not sold. Goads re-surveyed each map every three years and redrew any parts which had been altered. These new pieces were then pasted over the old. The map was then re-dated and Goads withdrew the earlier atlases from the insurance companies and replaced them with the new version. The maps were never on sale to the public, but today they are invaluable as evidence about old industrial sites. Purdey's, perhaps the most famous sporting gun manufacturers in the world, had head offices in South Audley Street and their factory in Irongate Road. So respected is the name of Purdey that I seem to remember a character in some long-forgotten novel saying that, in the event of a fire, he would rescue his Purdey and his family in that order. James Purdey founded his firm in 1814, so that it has flourished for almost two hundred years. The firm moved the factory to Praed Street in 1901 and stayed in North Wharf Road until 1979. From the start it has been a craft firm, with the craftsmen almost self-employed and at the top of their trades. Guns are made in sections; each part being made by a specialist who will make only that part all his life. Everything is done by piecework - each part being examined, passed and paid for in turn. Barrels are made first and tested. Then the stock is cut to the customer's measurements and shaped to suit the left or right sighting eye; the gun was engraved and the mechanism regulated. Finally, the gun is finished, having passed from hand to hand and the parts initialed, so that each one is a group creation with its own history. 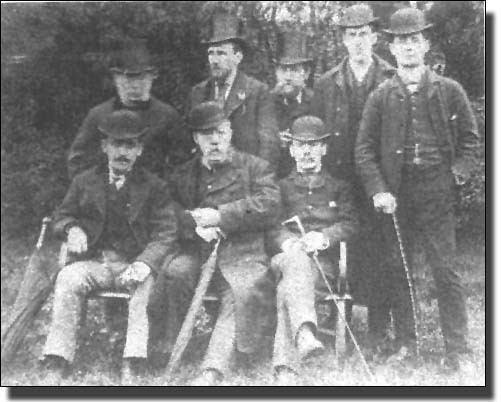 There was a thorough apprenticeship system based on the old guild practice. Only just the right number of boys were taken on to replace those nearing retirement. The boy was instructed in one aspect of gunmaking by a skilled craftsman and, after serving his time of seven years, he was recognised as a skilled worker. In 1880 Purdey s best quality guns, handmade throughout, cost £65 - £70, with delivery of eighteen months or more from the time of ordering. The factory In North Wharf Road had a large square light well in the centre, with the action makers above and barrel makers below. Wire netting was stretched over the well to prevent the barrel makers being stunned by tools dropped from the benches above. This did not prevent the fumes and smoke from the furnaces below pouring upwards, to loud protests. After the Second World War problems of inflation caused great concern. Guns took at least two years from ordering to delivery. In that time inflation would destroy any possible profit. The market too had changed. Few at home could afford the prices, so new customers had to be found abroad. At one period the firm branched out into tool and mould making for other firms, but ceased this in 1960. 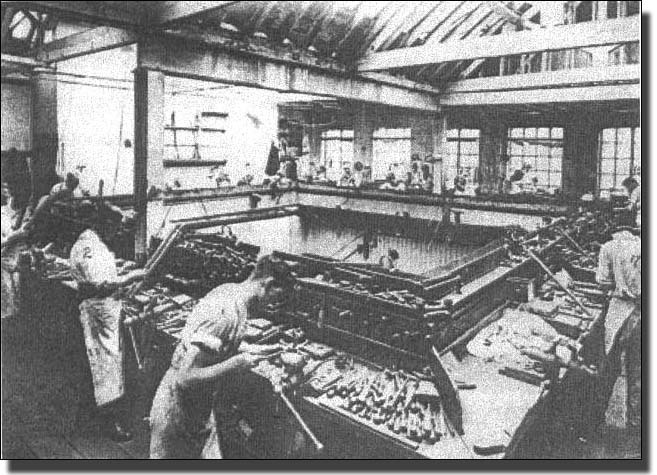 The Praed Street mould-making factory was closed, the firm moved to North Wharf Road, opposite Dudley House, and concentrated on gun making once again. In 1979 the firm moved to Hammersmith. In 2001 the factory site changed once again, becoming part of the second Metropole Hotel extension. People are now dancing to the echoes of ghostly shot guns and workshop banter.